This driver allows to use the device via network, the device can be attached to any MacOSX or Linux PC (NAS, Settopbox) and currently stream DVB-T, DVB-S to Windows Mediacenter and DVB-C to DVBViewer. As we are moving forward quickly with this it's work in progress, if you have any issues with it please let us know! - Updated network protocol to support routers like TP-Link WR1043ND, Netgear WNDR3700 etc. - Reworked installer a little bit. please ensure that the marked options are not selected, the first option is for lowering the network bandwidth utilization, the second one must not be checked to be able to use the tuner. Doubleclick onto the selected device is enough for connecting to it. Does this driver also supports USB Stick directly connected to the Windows machine?? After talking with our Engineer, it should be possible in near future as the code for it has already been written. Maybe we can push out some experimental version for DVB-T only (as this is the easier one) within the next 1-2 weeks. I have a question, will it be possible in the near future to use windows media player in combination with DVB-C functionality and by when? Will the stick work in a 100% windows 7 environment (I'm reading about Linux)? I'm planning to attach the stick to my NAS (D-link sharecenter pulse DNS-320). Is there any way to control the stick through a media player (by using windows media player or DVBviewer)? As DVB server i'm using linux with the current linux driver. tested with both the mini-pci-express and the usb media tv pro tuner. 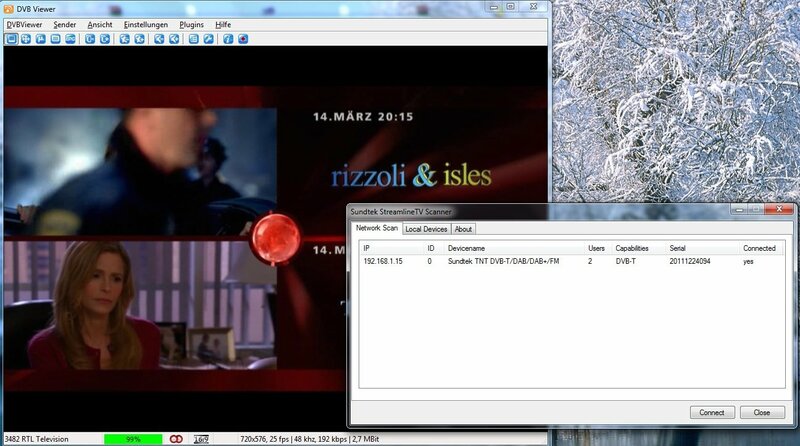 As client i'm using windows 7 , with the latest dvbviewer pro. Current sundtek network driver for windows. My cable provider is delivering two different types of transponders. Some transponders are migrated to QAM256. On DVBvieuwer switching between channels with the same modulation works fine. But when switching between channels witch different modulations (QAM64 -> QAM256 or the other way around) is very slow. Some more investigation on the linux DVB server learns that the DVBviewer client (or just the network plugin on windows) isn't directly tuning to the right modulation after tuning to a channel with a different modulation. I think it has to do with the windows network client because it seems to still requests the modulation, of the previous tuned channel/transponder. But maybe it's the dvb-c server on the linux side , which is not detecting the modulation change. The commands aren't sent as a complete transaction, rather than single commands. This is something that should be updated in the windows network driver on our side, we put it onto our todo list (unfortunately there are some other topics on our list right now... best would be to subscribe to this posting and we'll come back with a solution as soon as possible). As we are moving forward quickly with this it's work in progress, if you have any issues with it please let us know! Maybe it would be good idea to use translated version when detected OS language is not DE?